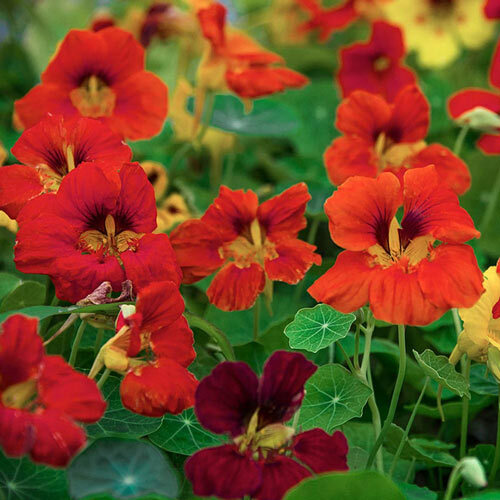 Edible, colorful and useful—Nasturtium Dwarf Mixed deserves a spot in every garden. The mix of orange, red, yellow and bicolor flowers bloom from summer to fall. The edible flowers and leaves have a peppery, spicy flavor and are tasty in salads and soups. Its seeds can be used like capers. Many gardeners plant nasturtiums near cucumber plants to repel cucumber beetles. Dwarf Nasturtiums grow just 12 inches tall with a 14-inch spread, making them easy to fit into containers, flower and vegetable gardens. These annuals grow best when planted in dry, loamy or sandy soils in full sun. 60 DAYS. ColorMixed - orange, red, yellow, bicolors. BloomsSummer to fall; June to September. Germination10-14 days at 70 degrees F.
Soil RequirementsDry, loamy, sandy soils. Thrive in soils where other plants cannot live. PruningDead-head regularly to prolong the flowering period. CommentsPeppery flavor, easy to grow, long flowering periods, excellent for bedding, borders and containers. All parts are edible. Classic companion to vegetable gardens. Attracts hummingbirds. Their presence will protect the cucumber plants from serious injury by these sap-sucking insects (ladybugs will eventually take care of all aphids on Nasturtium).